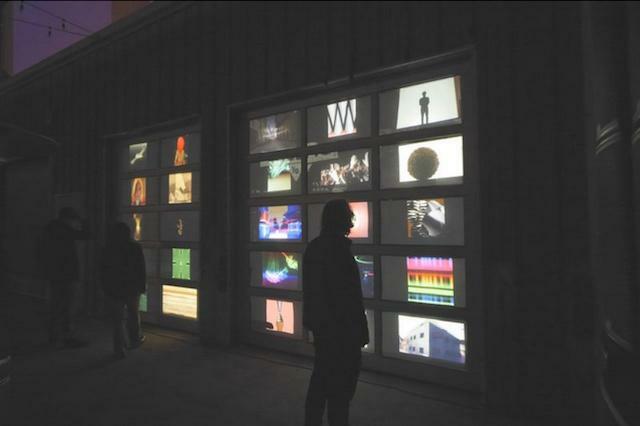 Over the past weekend, UPLOAD.gif, the first in a new series of partnered events between NewHive and Gray Area Foundation for the Arts, came to life as an ode to the GIF in an empty lot in San Francisco’s Mission District. “We wanted to put a positive spin on the idea of uploading,” said Zach Verdin, co-founder and CEO of NewHive. The user-friendly, webpage-building platform devoted to self-expression (imagine a modern Geocities) presented an open call for established and amateur artists to submit pieces that would turn the empty space outside their office into an “animated GIF playground”—as well as live in an online exhibition. In the end, over 650 pieces of work were submitted. At Saturday night’s party, nearly 150 of the pieces—selectively curated by Catherine Miller and Mat Dryhurst—were blown up large-scale and splashed against the outdoor space. Education was an important part of the weekend. During the day on Saturday, GIF-making classes were offered to those who wanted to get in on the fun but didn’t have the know-how, and artist talks on Friday night included appearances by Caitlin Denny on the history of the GIF (citing The Hamster Dance and Mouchette.org) while Andrew Benson discussed being an “overachiever” in a highly-constricted medium—and how examining GIFs you’ve made are like looking at your underwear drawer. Whether you think digital art is more interesting online or IRL, or whether you pronounce the format “GIF” or “JIF,” these were our favorite selections from the night.